Bæstet med tre hoveder efter græsk mytologi: Hades' hund Kerberos, som står ved dødsrigets port. This 3 headed beast is a reference to the Wolf of Sipoo. Enthusiasm and dedication of volunteers in this event, is as powerful and magnificent source that compares to the greatness of Kerberos. This design was picked by community vote in 2017! Tyyni (eng: Calm) got its name from the tournament (Nummela Autumnalstorm) that was going to be played the week after Tyyni. As a TD and a guy who loves puns, it hit me instantly; ”Calm before the storm”. Tyyni is played at the Kivikko disc golf course in Helsinki and it is, ironically, a really windy place. 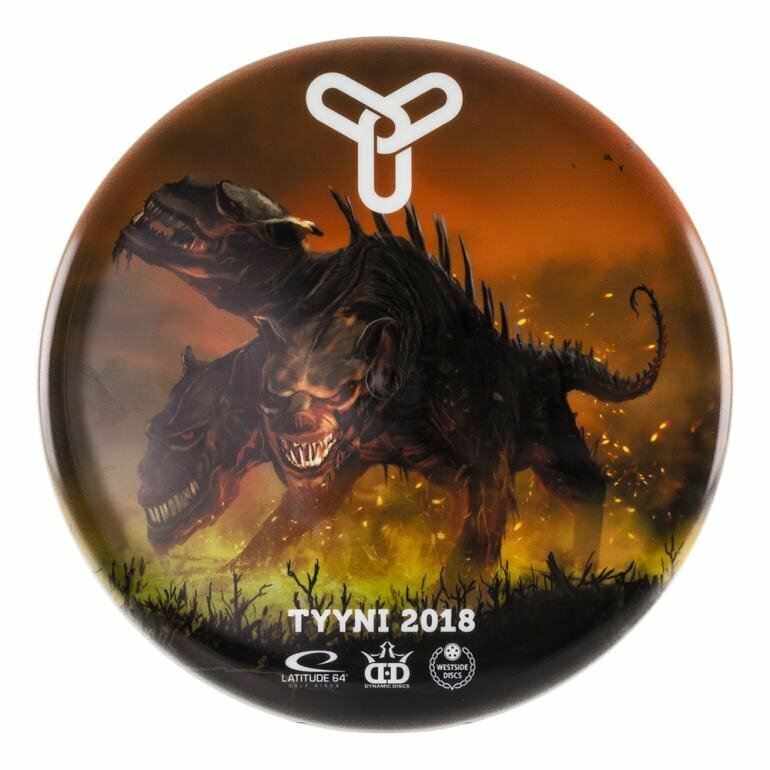 Tyyni is now known for its tough conditions where you need to use your most stable and trustworthy discs, and we shall see this saga continue. Måske den bedste midrange disc på markedet. Stabil og pålidelig til øvede spillere. 2018 Hittet, Eagle McMahon MD3. God stabil midrange disc, som kan klare masser af power og har en pålideligt fade. The DD2 Frenzy is currently the farthest flying Discmania brand driver and is possibly the longest flying Innova disc made! De fleste disc golfere har én alsidig driver som de ofte bruger - Undertaker er den nyre foretrukne. Den mest populære high speed driver fra Westside. Den hurtige disc til at alle spiller niveauer.